Michelle Obama mingled with the fashion elite as she cut the ribbon Monday to open the Metropolitan Museum of Art's newly renovated Costume Institute in New York. The first lady inaugurated the revamped gallery, now named the Anna Wintour Costume Center, and spoke to an audience that included fashion dignitaries such as Marc Jacobs, Donatella Versace, Carolina Herrera, Diane Von Furstenberg and Donna Karan. Other famous faces included Ralph Lauren, Calvin Klein, Stella McCartney, Michael Kors and Sarah Jessica Parker. 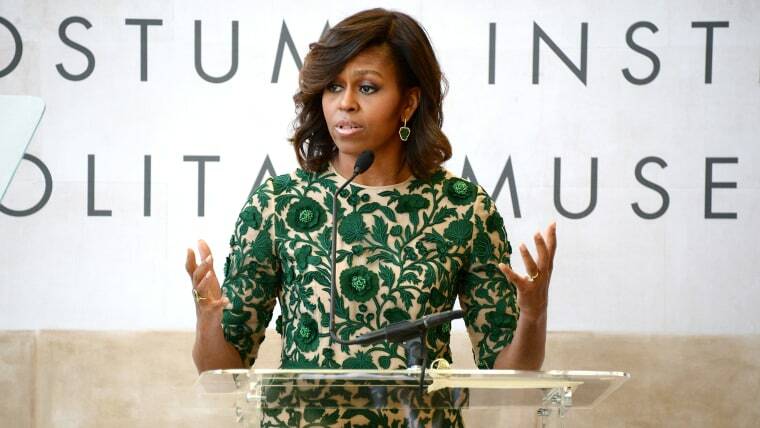 Obama, who wore a green floral Naeem Khan dress, praised Wintour for her impact on the industry. "I'm here today because of Anna. I’m here because I have such respect and admiration for this woman who I am proud to call my friend," the first lady said. "I'm here because I am so impressed by Anna's contributions, not just to fashion but to the many causes she shares and cares about, particularly this great American museum." Obama said the new center will demonstrate "that fashion isn’t an exclusive club for the few who can attend a runway show or shop at certain stores. This center is for anyone who cares about fashion and how it impacts our culture and our history." The Anna Wintour Costume Center will be the home to exhibition galleries, a library, a conservation laboratory, research areas and offices, according to the museum, which recently finished a two-year renovation of the center. The center's inaugural show is dedicated to master couturier, Charles James. The famed designer is credited with creating intricate and ornate pieces, as well as inspiring everyday wear like the infinity scarf, the wrap dress and the down jacket. Obama was also scheduled Monday to attend two New York events for the Democratic National Committee, according to the White House. 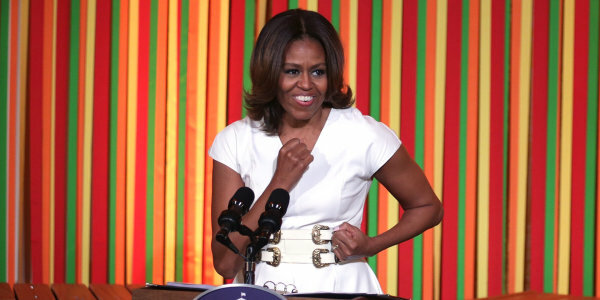 The first lady looks as sophisticated in designer dresses as she does in outfits from J. Crew.